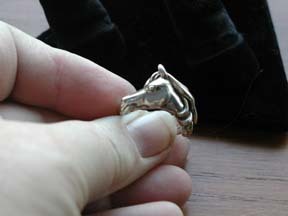 Special gift for those gals who love their horses! 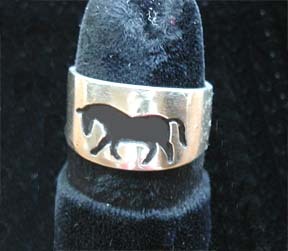 Ladies Sterling ring molded beautifully with creative work for special interest. Size 8, only. Did you see these at the Fjord Shows? Sterling Fjord image in relief, oxidized. Flat Sterling, not too thin and can be sized by your jeweler. I try to get various sizes. Let me know your size and I'll send the closest I have. My website has a combination of Shopping Cart Buttons & PayPal Buttons. Please use both and I'll combine the orders. Sorry for this slight inconvenience. If you don't care to use PayPal, call me.